Big Fastwater - Male version,but can be either. #2 Big Fastwater is about my sharing Maori & Celtic design to show a link with where I live. I tried to turn the dynamics of a New Zealand south-island, stony river into an icon, the rapids churning and the smooth fast flow. It also contains imagery & symbols from the northern hemisphere - Irish; German; Scandinavian; Scottish (which I knew would, reflect Maori imagery, and form the link of "here & there"). I have placed the more delicate design details in "safe from wear" positions to aid the intended long life of this ring. 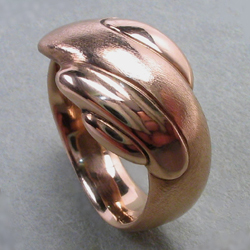 * * * 9mm wide at the top This example image is made using hard-wearing 9 carat pink gold. Big Fern - Male version,but can be either. #50 Big Fern is based on the Mamukau fern frond at the uncoiling stage, where the main spiral is unfurling and the smaller side fronds are also unwinding on both sides of the center stem. It also is the link to the celtic iconic spiral. #50 is the bigger & deeper-carved version of this concept and #66 Fern... is the finer female style. 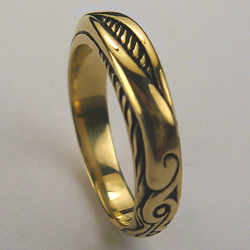 The pattern is carved deep into the gold, giving this design a long life. 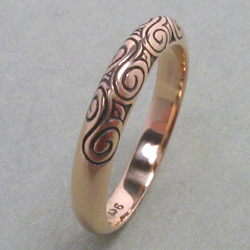 * * * 5.5mm wide at the top This example image is made using hard-wearing 9 carat pink gold. 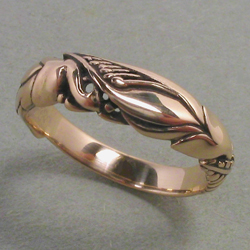 #57 Celtic Ring is a more delicate, feminine version of the #106 Big Fern ring. This design was inspired by the wooden carvings around an ancient Scandinavian church door. 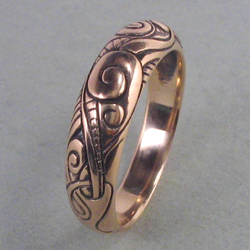 This design was the start of my seeing how I could link together Celtic & Maori imagery. 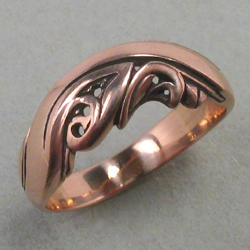 * * * 5.75mm wide at the top This example image is made using hard-wearing 9 carat pink gold. #66 Fern is is based on the Mamukau fern frond at the uncoiling stage where the main spiral is unfurling and the smaller side fronds are also unwinding on both sides of the center stem. It also is the link to the celtic iconic spiral. 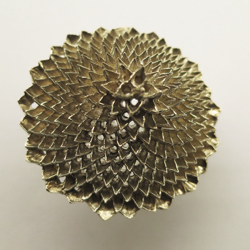 (#50 is the bigger version of this concept) The pattern is deeply incised into the gold alloy to give this design a long life on your finger. 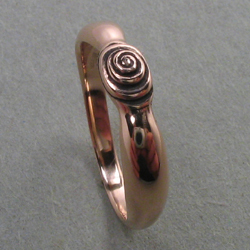 * * * 3.5mm wide at the top This example image is made using hard-wearing 9 carat pink gold. #68 Solar....The spiral.. solar system..embryo & germinating-seed, with its root and stem, curling. The Celtic / Maori usage of this symbol embodies "the energy of life". (I tried to keep this brilliant symbol very humble and subtle as a quiet reminder of the power of the spiral.) #108 Big Solar design is a bigger more robust version for male or female. 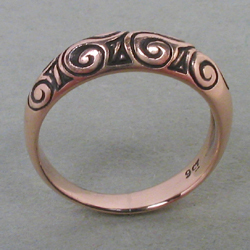 * * * 3.5mm wide at the top This example image is made using hard-wearing 9 carat pink gold. #84 Small Fastwater, is about my blending Maori & Scandinavian (Celtic) design, to show a link with where I live. I tried to turn the dynamics of a south-island, stony river into an icon, the rapids churning and the smooth fast flow. It has imagery & symbols of the northern hemisphere - Irish; German; Scandinavian; Scottish (which I knew would, reflect Maori imagery, and form the link of "here & there"). #2 Big Fastwater is a more robust version of this ring. 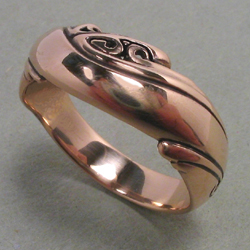 * * * 6.5mm wide at the top This example image is made using hard-wearing 9 carat pink gold. #100 Kowhai was designed to honour our Tui and it's fantastic vocal melodys which loves the Kowhai berries and would've been my choice as our national bird as it is such a incredible singer and so agile. 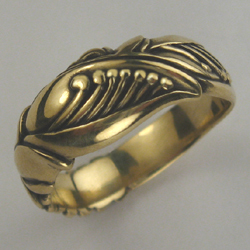 #105 Big Kowhai is a another version,which sits flatter on the finger, and suits Male and Female. 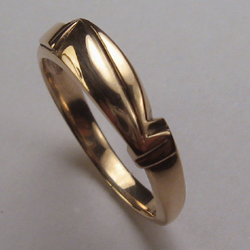 * * * 6mm wide at the top This example image is made using hard-wearing 9 carat pink gold. 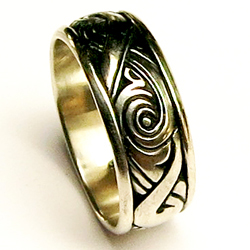 Organic Ring - Female version,but can be either. #103 Organic Ring ...I have tried to incorporate Deco and Organic design elements in this ring which is about the ebb & flow of the tidal beach where I live. The surface has two surface finishes, I make a fine textured design around the shank, whilst the "Flow" forms are fluid, and polished. 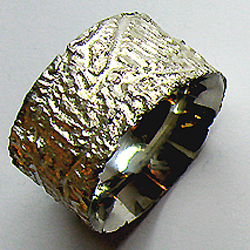 This is a strongly built ring, & will cope with being worn in Nature. 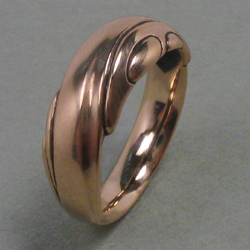 * * * 11.5mm wide at the top This example image is made using hard-wearing 9 carat pink gold. Big Slow River - Male version,but can be either. #109 Big Slow River has a more organic design emphasis than #2 Big Fastwater and has a more rounded, flowing format.The inside of the shank is also convex,to be more comfortable to wear. I hope it gives a deep calm and relaxed vibe of these rivers, to the wearer. I tried to turn the dynamics of a south-island, stony river into an icon, but this design has no rapids, just the smooth fast flow. I have placed the more delicate design details in "safe from wear" positions to aid the intended long life of this ring. 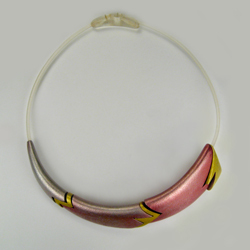 * * * 8mm wide at the top This example image is made using hard-wearing 9 carat pink gold. Space Junk - Male version,but can be either. Seen here in Sterling Silver, I designed this ring to appear "inlaid" with bits of outer-space. It is textured to accept life's-knocks & withstand heavy wear well, so as you wear it ,the new marks add to its design. 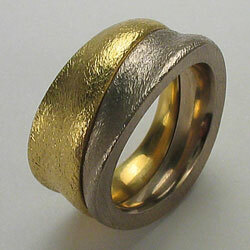 * * * 9mm wide at the top This ring can be made using hard-wearing 9 carat pink gold. 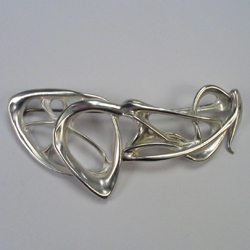 #116 Small Tidal is from my Tidal series..seen here in 9ct white special alloy. It has two surface textures, one to mimic the sand of my beach, with the polished elements being the liquid flow of the sea. 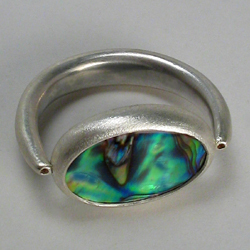 This can also serve as a "pair" ring, being designed with an inner-curve in it's shank, to accommodate a client's engagement ring (with a set stone). #129 & #148 are the male versions of this design. 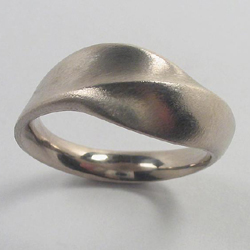 * * * 7mm wide at the top This ring can be made using hard-wearing 9 carat pink gold. 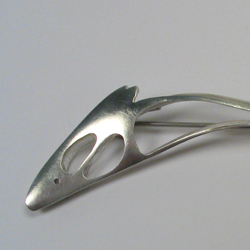 Small Fin - Female version,but can be either. #117 & #125....seen here in 9ct white special alloy. Fin designs are my attempt to capture the "roll" of the sea just before it lifts up to be surf on my beach. The texture is to reflect glittering water, shifting beyond the breakers. It is also part of my "Boy-Proof" range. 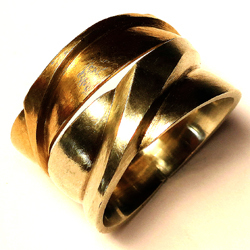 A Surfies ring, hence the hammered surface which hardens the ring and allows more fine dents from life..to add to the look and soul of the design. 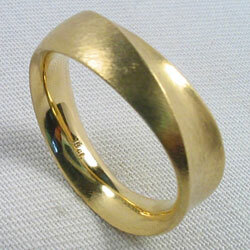 * * * 8mm wide at the top This ring can be made using hard-wearing 9 carat pink gold. Big Fin - Male version,but can be either. #125 & #117..seen here in 18ct gold, Fin designs are my attempt to capture the "roll" of the sea just before it lifts up to be surf on my beach. The texture is to reflect glittering water, shifting beyond the breakers. It is also part of my "Boy-Proof" range. 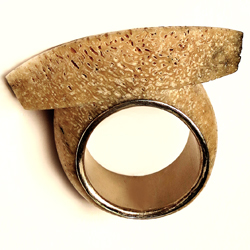 A Surfies ring, hence the hammered surface which hardens the ring and allows more fine dents from life, to add to the look and soul of the design. 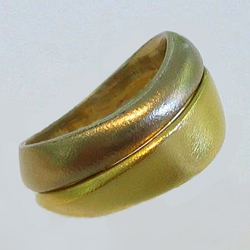 * * * 10.5mm wide at the top This ring can be made using hard-wearing 9 carat pink gold. 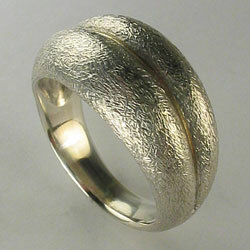 #128 High Twist seen here in 9ct white special alloy, is part of my series of "germinating" concept rings. Celebrating the " Biophyllic"(of life) The top is parting or opening, to allow growth to emerge. 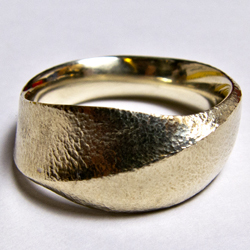 This ring is also textured to add dynamic to the organic growth concept. 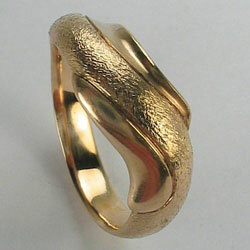 * * * 5.5mm wide at the top This ring can be made using hard-wearing 9 carat pink gold. Big Tidal - Male version,but can be either. #129 Big Tidal, seen here in 9ct yellow alloy, is another in my Tidal series.It has two textures ,one to mimic the sand of my beach,the polished elements being the flow of the sea. This could also work as a pair ring. I designed this ring to have a inner-curve in it's shank, to accommodate client's engagement rings (which have set stones). #129 & #148 are the intended male version of this design. 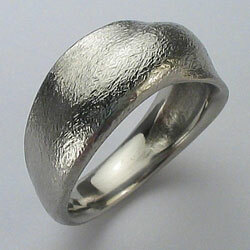 * * * 7.75mm wide at the top This ring can be made using hard-wearing 9 carat white gold. 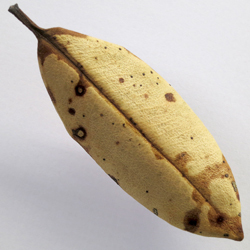 Ripe - Female version,but can be either. 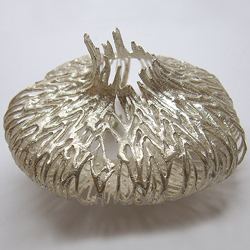 #130 Ripe, seen here in 9ct white special alloy, is part of a series of "germinating" concept rings. Celebrating the "Biophyllic" (of life). 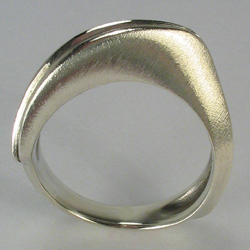 The top is opening,to allow growth to emerge.This ring is also textured to add dynamic to the concept. * * * 11.75mm wide at the top Shown here in silver, this ring can also be made using hard-wearing 9 carat white or pink gold. Sandform - Male version,but can be either. 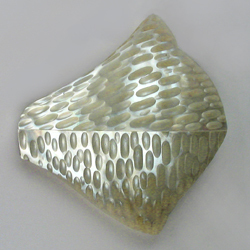 #135 Sandform, seen here in 18ct white alloy, evolved from the way sand dunes at my beach form-up & then fall away from the ridge,creating this eloquent image, The surface is textured to mimic the sand. 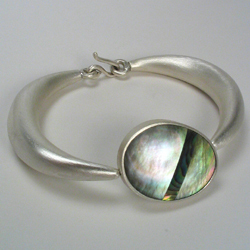 In 18ct white gold,the grey tone of this alloy matches the soulful shade of my black sand beach. This is a very comfortable ring to wear because the inner shank is rounded & the outer edge is minimal. 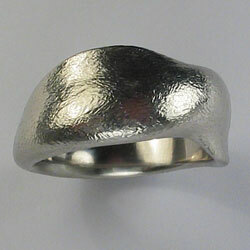 * * * 9mm wide at the top This ring can also be made using hard-wearing 9 carat white or pink gold. Sand & Wind - Male version,but can be either. 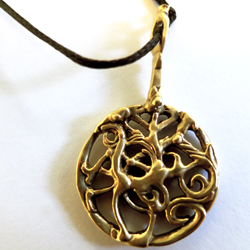 #136 Sand & Wind, seen here in 18ct yellow alloy,...This design evolved from the way sand dunes at my beach form-up & then fall away from the ridge,creating this eloquent image. 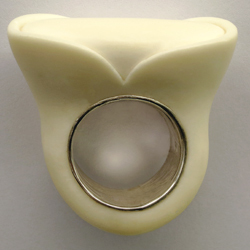 It too is textured to mimic the sand.This is a very comfortable ring to wear because the inner shank is rounded & the outer edge is softened. .#137 is the finer female version of this design. 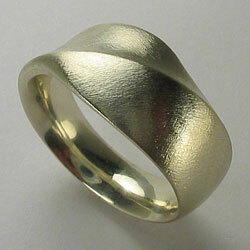 * * * 5mm wide at the top This ring can also be made using hard-wearing 9 carat white or pink gold. Atoll & Reef - Female version,but can be either. #140 Atoll and #141 Reef, shown here in 9ct white gold & 18ct yellow gold. Part of my Dual ring series, each is a separate ring allowing the Reef band to fit snug against either side of the Atoll, which offers the wearer a different looking design. 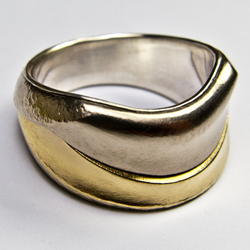 Both rings are textured to assist showing the form and create an organic effect. In time this surface matures into the wearers lifestyle..absorbing more fine marks from their life. 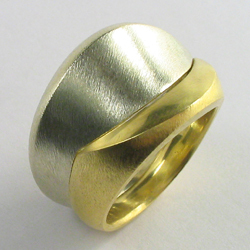 * * * 11mm wide at the top (both rings) This design can also be made using hard-wearing 9 carat white or pink gold. #142 Dune ( #143 Tide ) Shown here in 9ct white gold & 18ct yellow gold. From my Dual ring series, each is a separate ring, the Tide band is polished only on the "crescent" & fits alongside Dune. 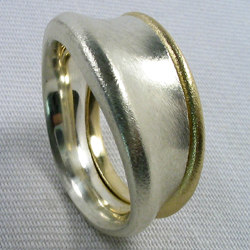 Both rings are textured to assist showing the form & to create an organic effect.I n time this surface matures into the wearers lifestyle..absorbing more fine marks from their life.This Dual Series requires me to make accurate sizing's & the client to have even-tapering fingers ,with subtle knuckles. The careful close fit to your finger, keeps the two rings together. . * * * 12mm wide at the top (both rings) This design can also be made using hard-wearing 9 carat white or pink gold. From my Dual Ring series, Shown here in 9ct white gold & 18ct yellow gold, both are textured to assist showing the form & to create an organic "Strata" effect. In time, this surface matures into the wearers lifestyle..absorbing more fine marks from their life. This Dual-Series requires me to make very accurate sizing's & the client,requires even-tapering fingers ,with subtle knuckles. Each ring can fit either side of the other, in many combinations on the finger. 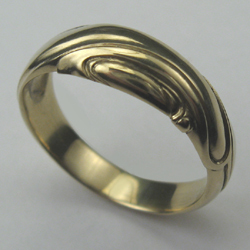 * * * approx 12mm wide at the top (both rings) This design can also be made using hard-wearing 9 carat white or pink gold. #149 Big Sandform. Shown here in 9ct white special alloy. 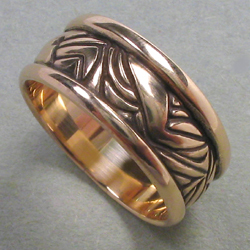 This evolved from the way sand dunes at my beach form-up & then fall away from the ridge,creating this eloquent image.Textured to mimic the sand & to create an organic effect, in time, this surface matures into the wearers lifestyle,absorbing more fine marks from their lifeThis is a very comfortable heavy ring to wear because the inner shank is convex & rounded. * * * 11.5mm wide at the top This design can also be made using hard-wearing 9 carat white or pink gold. This Series are "One of a Kind", & are a tribute to the sunsets at my beach. 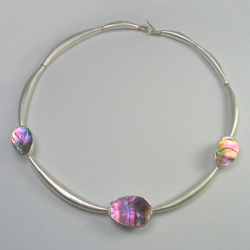 I have used Mother of Pearl (Fiji) & Nickle(New Caledonia) The shell is held with Silver rivets & the base is translucent acrylic,a heavy polyester cord connects the "beads" and it Screwed open & closed. One of a Kind, This is a tribute to the sunrises at my beach. 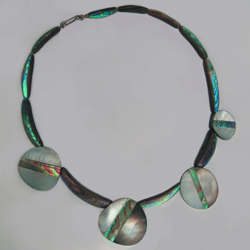 I have used Mother of Pearl (Mela Mela..Fiji) & Nickle(New Caledonia) The shell is held with Silver rivets & the base is Black acrylic,a heavy cord (polyester) connects the "beads" and it Screwed open & closed. 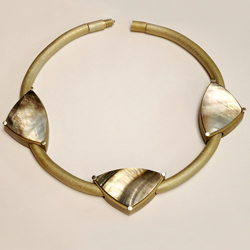 This design allows the MOP beads to be worn in two positions around your neck. This Brooch Series are One of a Kind, & are a tribute to the beauty of Mother of Pearl (Fiji).....( which I see as the voice of god. ) 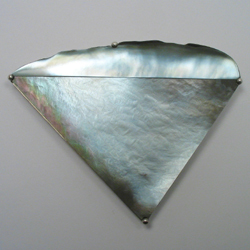 The shell is held with Silver rivets & the base is & Nickle (New Caledonia) These two materials ..Mela Mela (mother of pearl) gave me the chance to construct an object out of the Pacific Environment. This Brooch Series are One of a Kind, & are a tribute to the beauty of Mother of Pearl (Fiji)..........( which I see as the voice of god. ) The shell is held with Silver rivets & the base is & Nickle (New Caledonia)These two materials ..Mela Mela (mother of pearl) gave me the chance to construct an object out of the Pacific Environment. This is part of a One of a Kind series using assemblies of experimental wax-castings when I was studying how to make "organic" forms. Looking for Nature to teach me her tricks. Here I have combined 3 forms .The tiny "set " dot at the extreme left was textured by pouring melting wax on my freezer ice. 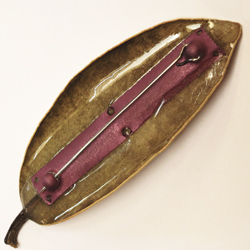 This Brooch is part of a One of a Kind series using assemblies of experimental wax-castings when I was studying how to make "organic" forms & looking for Nature to teach me her tricks. The Flower head "set " dot at the extreme left was textured by pouring melting wax on my freezer ice.I joined two test-parts & then began the demanding fine-tuning of the two parts to achieve harmony within the whole. 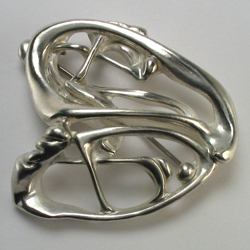 This Brooch is part of a One of a Kind series using assemblies of experimental wax-castings produced when I was studying how to make "organic-Linear " forms, looking for Nature to teach me her tricks. I joined two test parts to create this "celtic " heart, & then began the demanding fine-tuning of the two parts to achieve harmony within the whole. #34 Rye Sheaf ...Part of my life seed series ..this is the food staple of my Scandinavian forbears. Shown here in 9ct yellow gold * * * 4.5mm wide at the top This design can also be made using hard-wearing 9 carat white or pink gold. #83 Small Slow River. Shown here in 9ct yellow gold, this has a softer, more organic design emphasis than #84 Fastwater, I hope it gives a deep calm and relaxed vibe of these rivers, to the wearer. The #109 Big Slow River is the bigger, robust, version of this Shown here in 9ct yellow gold * * * 6mm wide at the top This design can also be made using hard-wearing 9 carat white or pink gold. Big Kowhai - Male version,but can be either. #105 Big Kowhai. Shown here in 9ct yellow gold. 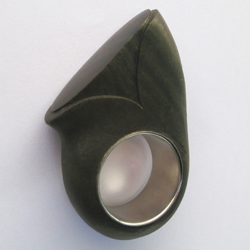 Designed to honour our Tui (and it's fantastic vocal melodys) which loves the Kowhai berries and would've been my choice as our national bird, as it is such a incredible singer and so agile.This version of #100 ,sits flatter on the finger. I also make a modified option of #105 ,to allow a 5.5mm cut stone setting, between the two flowers( which are parted to take the stone) * * * 8mm wide at the top This design can also be made using hard-wearing 9 carat white or pink gold. #133 Part of my Dual ring series. Shown here in 9ct white gold & 18ct yellow gold. 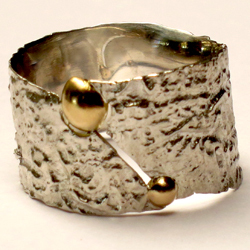 Both rings are textured to assist showing the form & to create an organic "Strata" effect. 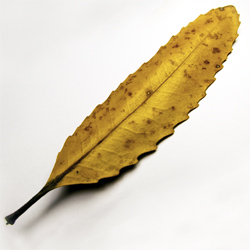 In time, this surface matures into the wearers lifestyle..absorbing more fine marks from their life. This Dual Series requires me to make very accurate sizing's & the client, to have even-tapering fingers ,with subtle knuckles. Each is a separate ring allowing each band to fit snug either side of the other, in many combinations on the finger. 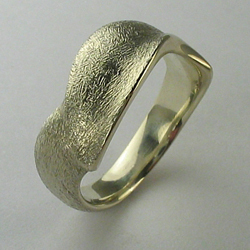 * * * approx 10mm wide at the top (both rings) This design can also be made using hard-wearing 9 carat white or pink gold. Shown here in 9ct special white gold. 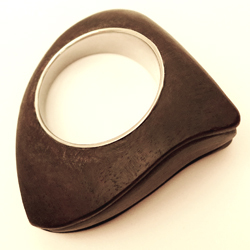 This ring is textured to assist showing the form & to create an organic effect.In time this surface matures into the wearers lifestyle..absorbing more fine marks from their life. 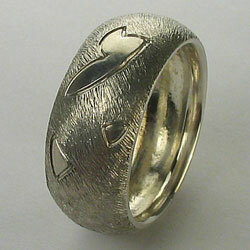 This hollow,hand-forged silver shank supports a two-sided setting,that can be swiveled to show either side. 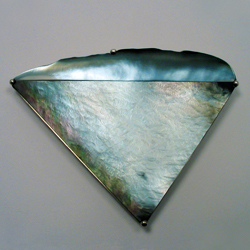 Mother Of Pearl or Paua. 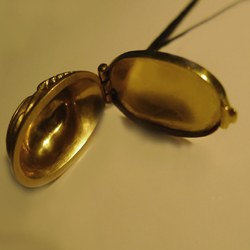 Scarab Locket - Female version,but can be either. Shown here in 18ct yellow gold. Pacific Ring - Female version,but can be either. 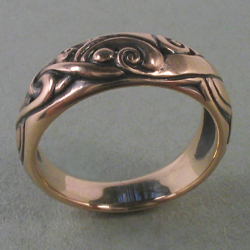 This ring has a basic Celtic format of a richly carved band with two fluted, framing sides and like #42 Fisherman, I designed the pattern to change, around the band, so it was quite different from another view on the hand.This design is based my study of the carving style of Pacific Art. It is a more delicate ring than #42 Fisherman and requires a bit more care if worn by a man who uses his hands. Fisherman - Male version,but can be either. 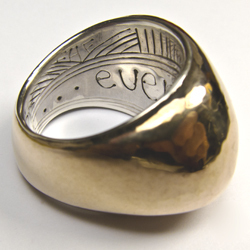 This ring has a Celtic format of a richly carved band with two fluted, framing sides. I designed the pattern to change, around the band, so it was quite different from another view on the hand. 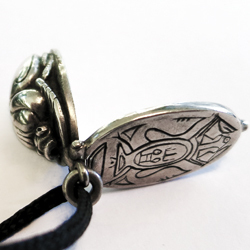 It tells a romantic story of a fisherman standing in the sea, with his line and hook , a mermaid as his catch. The view from a craft out to sea...looking back to the dunes. 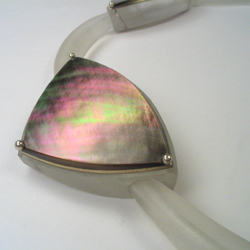 These two materials ..Mela Mela (mother of pearl) & Nickel from New Caledonia gave me the chance to construct an object out of the Pacific Environment. On the lower section, I textured the surface to mimic the sea. 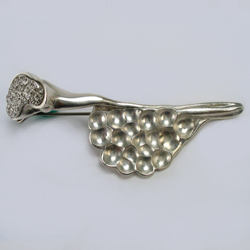 This can be worn on many angles due to the choice of brooch pin clips. 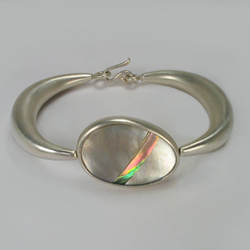 These two materials ..Mela Mela (mother of pearl) & Nickel from New Caledonia gave me the chance to construct an object out of the Pacific Environment. I textured the surface to mimic the imprint of rain on the sand. 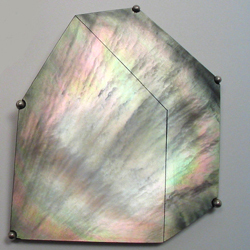 These two materials ..Mela Mela (mother of pearl) & Nickel from New Caledonia gave me the chance to construct an object out of the Pacific Environment. I textured the surface to mimic rain falling, to imprint on the sand. Part of a One of a Kind series using assemblies of experimental wax-castings,created when I was studying how to make "organic-Linear " forms, looking for Nature to teach me her tricks. I joined two test-parts to create this rhythmical form.Then began the demanding fine-tuning of the two parts to achieve harmony within the whole. 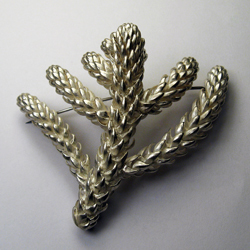 This Brooch is part of a One of a Kind series using assemblies of experimental wax-castings,created when I was studying how to make "organic-Linear " forms looking for Nature to teach me her tricks. I joined two test-parts to create this rhythmical form. 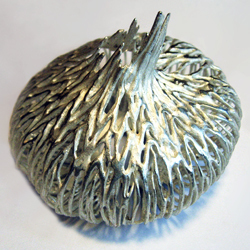 This is a "Unique" one-off piece..made by experimenting with lost-wax casting. 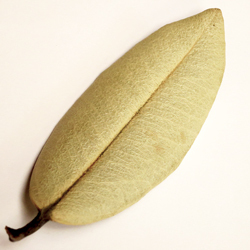 This is part of the base of the flower,which holds the stamens. The Fibonacci geometry amazes me. 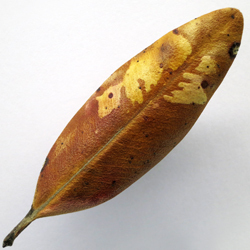 I cast this directly from Nature,but spent many hours reworking the detail to create the definition I wanted. 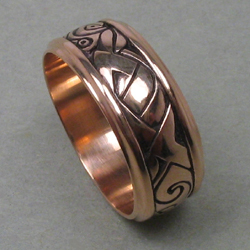 Big Celtic ring - Male version,but can be either. I had this "winking" at me for years in my studio.. until I just had to try and cast it ...very tricky... lots of finishing required. 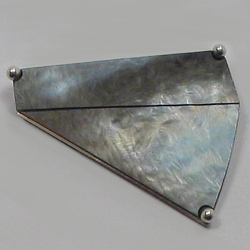 This brooch consists of two slices of Mela-mela, one textured held to a backing of Kanak nickel, with "pin head" rivets. 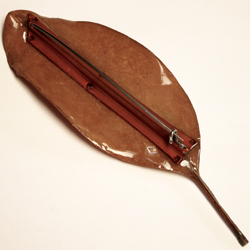 Real Leaf,Resin,Anodized Aluminium,with a Stainless Steel inlaid stem support, that is inserted into the end of the stem to make it strong. Pink Acrylic and Mela Mela. This Series are "One of a Kind", & are a tribute to the sunsets at my beach. 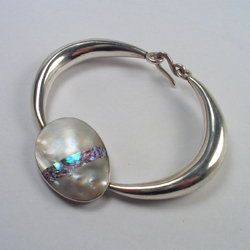 I have used Mother of Pearl (Fiji) & Nickle(New Caledonia) The shell is held with Silver rivets & the base is two shades of acrylic, a heavy polyester cord connects the "beads" and it Screwed open & closed. 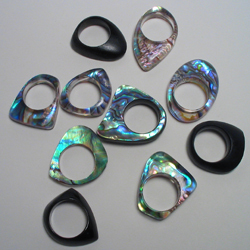 Each ring is unique...and is constructed with a clear or black base. Shown here in 18 ct White & Yellow alloy. This is a new aspect of my double ring set designs. 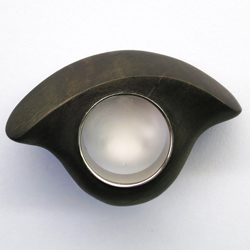 Normally,they are two entirely separate rings,that sit together, due to a comfortable, but exact fit on your finger. I can now link them together securely, using a silver inner shank. 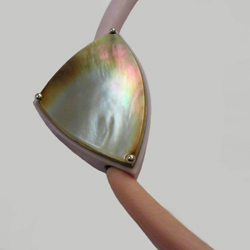 This enables this design to work, where you may have a larger knuckle. 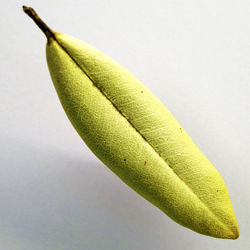 A dynamic sprouting seed..bio-phylic energy...birth. 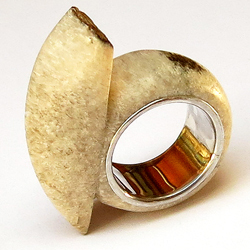 I have tried to express the life urge of nature with this delicate, jazzy ring. 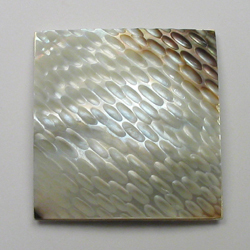 This is shown in my special, hard-wearing 9 ct White alloy,which has a "moonlight" tone.I have also hammered the surface for two reasons,it hardens the surface and it also emulates the surface of the sand-dunes and the roll of the sea. 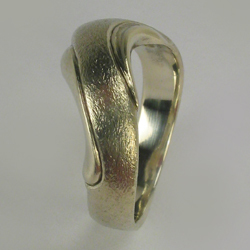 I designed this ring to be very comfortable & wear well, for a "surfie"...This design evolved from the way sand dunes at my beach form-up & then fall away from the ridge,creating this eloquent image. 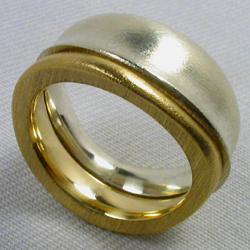 It too is textured to mimic the sand.This is a very comfortable ring to wear because the inner shank is rounded & the outer edge is softened. Gold dyed Anodized Aluminium, & Mela-mela, The beads are threaded with heavy nylon. This Series are "One of a Kind", & are a tribute to the sunsets at my beach. 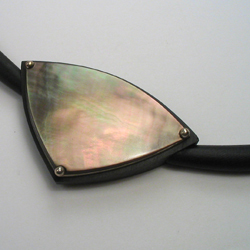 I have used Mother of Pearl (Fiji) & Nickle(New Caledonia) The shell is held with Silver rivets & the base is Gold dyed Anodized Aluminium ,a heavy polyester cord connects the "beads" and it Screwed open & closed. 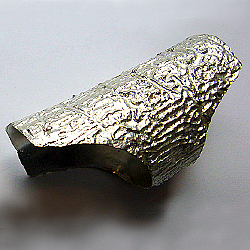 Cast in Sterling Silver from an actual dried Bulb. 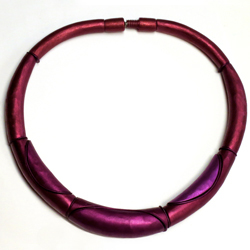 Magenta dyed, Anodized Aluminium,beads threaded with heavy nylon. The Three main beads have been cut longitudinally, & dyed, with varying intensities. Blue Whale Bone & Stg. Ode to Noguchi. Stainless Steel inside a Lignum Vitae wood form. This is an "Ode" to Brancusi, loaded.... because I have inscribed a short statement inside each of these individual rings. I can, for example inscribe "how can we be sublime?........how can we be so blind? " or ...."we deserve less". 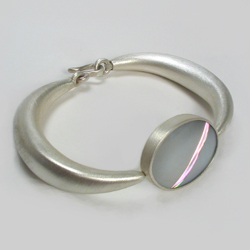 I am interested in your preferred,Haiku... or comment.I also make these from a special White bronze,with a silver insert , or entirely from Sterling silver. Limousin Ox Bone & Stg. This is from my "Life-Bud" series...Erich Fromm wrote the brilliant book, "the anatomy of human destructiveness".This taught me the meaning of the word Bio-phyllic.. This design is my attempt at reflecting his hopes for our future. #150 Big Weave Ring Set. 18 ct Yellow & 9 ct White Gold. This was inspired by the woven flax "Kete" (Maori food container). I can make this design in any choice of alloy. 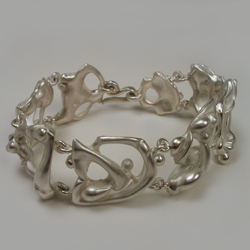 Cast from Nature in Silver. 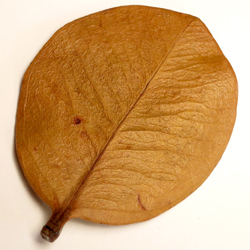 A real leaf. 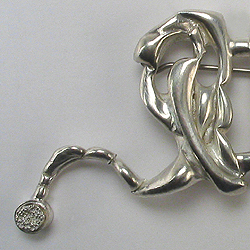 I have inserted a hand-forged stainless wire into the back of the stem to strengthen this part & the whole back is layered with clear resin.the anodized aluminium brooch fitting is " bedded" into the resin,so the whole brooch is very strong. I have tried to emulate the twist & roll of the whale in the form. The dark tip is the extremity of the skin of the actual bone I had to work with. My special White Gold 9ct alloy. Shown here in 9ct gold, this is my re-design combining 3 Nordic Cloak buttons into one concept.